All the pet insurance policies featured in our pet insurance top 10 are available in Northen Ireland. Or check out our unique pet insurance policies. They are all valid in NI and we have a policy that includes pre-existing conditions and one for puppies and kittens that will never go up in price. How much does pet insurance in Northern Ireland cost? It can help to have pet insurance if your dog falls ill or is injured and it can also pay out if your dog bites somebody or damages their property. All of the companies on our list of best pet insurance for dogs offer cover in the UK, including Northern Ireland. We've negotiated a 32% discount for More Than pet insurance for Bought by Many members. To take advantage, simply join the group. We have also created our own pet insurance policies. We have three policies that are entirely new to the market. All of our pet insurance policies are available in Northern Ireland. Apart from vet fees and medication, pet insurance can also provide cover for loss, theft and death. And if your dog disappears, your insurance may pay out for advertising materials to help find it. With so many companies offering cover, there is a range of policies that may be appropriate for different owners. Owners of a breed that is prone to illness may want to consider a policy with a higher vet fee limit. Our Complete policy can cover up to £15,000 of vet fees a year and includes dental cover as standard. If your dog is under two you can get our Fixed for Life policy and your premiums will never go up, even if you claim. If your dog is older you might want to find a policy that is better suited to an older dog. Unfortunately, a lot of insurers will quote higher premiums to owners of older dogs. We've negotiated a 10% discount on pet insurance for older dogs for our members. Join the group to unlock the discount. In addition, older pets are more likely to have suffered from medical conditions in the past. If your pet has or has had a condition, you might struggle to find cover and you might have to pay extra attention to the small print. Some insurers define a pre-existing condition as one a pet has suffered from at any point in its lifetime. At Bought by Many, we define a pre-existing condition as one a pet has suffered from or received advice or treatment for in the past two years. We have created a specialist Pre-existing conditions policy that covers pets for conditions they’ve had, but have not had any treatment or seen a vet for in the three months before the start of the policy. If your dog is on the Dangerous Dogs (Northern Ireland) order 1991 list (a Pit Bull, Japanese Tosa or any dog bred for fighting) you might struggle to find cover altogether as most insurers will refuse to insure it. We have a group for Pit Bull Terriers here where you may be able to get cover. 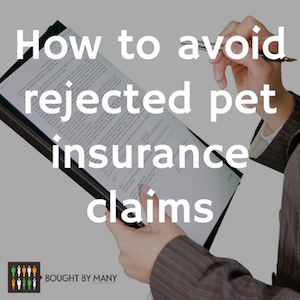 Read more about Bought by Many’s unique pet insurance policies here. All the companies on our list of the best pet insurance for cats will cover pets in Northern Ireland. There has been a surge in cat disappearances and deaths with 70 cats going missing around Newry recently. Pet insurance could pay for advertising materials to help you find your cat. Animal rescue centre, 7th Heaven, says that they’ve had 189 cats reported missing in 2017 and strongly advises cat owners to keep their felines in the house, worried that someone might be copying the M25/Croydon cat killler. Cats are smaller and arguably less likely to run into trouble than dogs, but they, too, can get injured or contract a disease resulting in a hefty vet bill. In the case of a cat that was hit by a car and sustained eye and jaw injuries, the vet’s bill was £1,800, according to MoneySupermarket. Need help to find the right pet insurance for your cat? Here is our list of the best pet insurance policies for cats. The average annual premium for dog insurance in the UK is £366, or around £30 a month, according to Consumer Intelligence data based on 200 dog insurance quotes. The average annual premium for cat insurance in the UK is £100, or around £8.33 a month, according to Consumer Intelligence data. In November 2017 a quote for a small mixed-breed dog under two years old in a Belfast BT9 postcode was £28.73 per month on our Fixed for Life policy and £21.38 on our Complete policy. A quote for a mixed-breed cat in Belfast BT9 postcode was £13.20 on our Fixed for Life policy and £12.61 on our Complete policy. Please use the above quotes as a guide only. Learn more about the costs of dog insurance here. Learn more about the costs of cat insurance here. Some policies, like accident-only policies, tend to be cheaper. An accident-only policy will cover vet fees if your pet is injured in an accident. These policies, although cheaper, will not cover you if your pet falls ill.
For policies that cover illness, time-limited and per condition cover tend to be cheaper than more comprehensive lifetime policies.To find out more about these terms, have a look at our help centre. With a lifetime product, it is important to note that your premiums will increase each year at renewal. This is different to a “Per Condition” policy, where a particular condition can become excluded once the condition limit is reached. Please note that when your pet turns 9, a fixed excess of £69 plus 20% of each claim will apply. You may be more likely to use up the cover available on a time-limited or per condition policy, meaning you'll then have to pay for further vet treatment. The same can happen if you choose a cheaper policy with a low vet fee limit. Some companies offer deals on their cover. With our MoneyBack policy, you’ll get 20% of your annual premium paid back every year you don’t claim. We also offer a 15% multi pet insurance discount when you insure more than one pet on the same policy. Also, if you join Bought by Many you'll have access to insurance discounts that we’ve negotiated with other insurers. We’ve also listed the companies that offer the cheapest pet insurance for dogs. You can compare quotes on Compareni.com or get quotes from individual providers yourself. However, use comparison sites with caution as some insurers might have made it into the top of the results by deliberately creating cheap policies with low levels of cover. Make sure to shop around before you buy. To learn more about other pet insurance providers whose policies are available in Northern Ireland, read our in-depth reviews of providers like Direct Line and More Than here. "I've just saved £30 a year on my renewal going through your website. A big thank you from me and Pippy!"